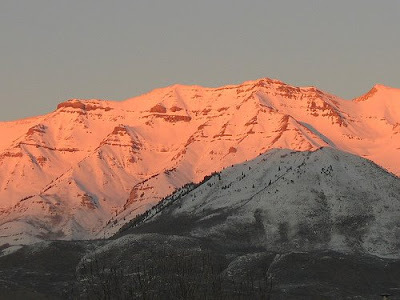 I recall one occasion when the folks were living in Pleasant Grove, at the foot of Timp. One fine spring day, mom happened to notice some gold coloring along the bench area, and wondered what was causing it. Asking some of the long-time residents of the area, they were told it was just weeds, and there was no way to access that part of the mountain anyway. So, my folks being the adventurous types, set out to explore the west face road and ended up in a meadow surrounded with countless millions of dazzling yellow flowers of several different varieties. They were amazed and gratified. Difficult to believe that all those people had lived at the foot of the mountain all those years, and knew so little about it. Those adventurous rides were sometimes a bit frightening. I was always sure we would fall off the face of the mountain - Dad never seemed a bit nervous. I remember once we had a picnic and Ruth included in the blessing on the food a plea that the old land crusiser's brakes wouldn't fail while we were eating. You obviously misunderstood -- Dad has never put us in jeopardy. It made enough of an impression that you still remember the occasion though. I would bet that Ruth still remembers it well, too. Some of the best times of my life were just spending time together with family in the car. Doesn´t matter as much where we were going or what we intended to do, just that we were together. That memory is worth a lot. This past Sunday, Mother's Day, I chose to invoke a ride up the canyon. My Hub, two boys and my oldest grandson came with. We just tooled up both Big and Little Cottonwood. Amazing.Still sooo much snow! One resort still had skiers and boarders out! Saw waterfalls that aren't usually there. Too cool! Driving in the car anywhere is my favorite way to spend time with my family! Must be from when we were kids.